This desk-friendly makeup kit features all of the products you will want to take on the go, plus , a reusable acrylic box with a mirror inside. 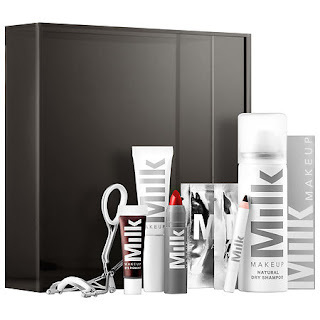 The set has an array of makeup products for day to night makeup looks. The Natural Dry Shampoo has a refreshing formula that naturally absorbs excess oil to extend the life of a blow out while its white tea scent leaves hair feeling revived. With a lash-loving formula that won't flake and stays put all day, the Ubame Mascara has a signature blend of ubame oak charcoal and sapphire dust to bring added dimension and color depth to lashes. The two Micellar Water Makeup Remover Wipes provide a technologically advanced cleansing system that uses non-ionic micellar action to entrap and lift both oil- and water-based impurities from the skin in a single wipe. The mini Lip Color in O.G. Red is a creamy red lip color that provides full-coverage, comfortable wear, and lasts all day. The mini Gel Brow in Pilsner features a smooth, brown matte gel formula in pencil form that quickly and easily glides onto brows. The mini Eye Pigment in Silent Disco delivers a highly pigmented brown, long-wearing cream shadow in a portable tube for attention-grabbing color in one swipe. Use the Roll + Blot: Portable blotting sheets that are made with unbleached hemp fibers to absorb excess oil and reduce shine without disturbing your makeup. With its perfect design, the Eyelash Curler leaves the full lash line beautifully lifted and curled without pinching, always a plus. The set contains the following: Roll + Blot Sheets; 2x Micellar Water Makeup Remover Wipes; Eye Pigment in Silent Disco (brown); Lip Color in O.G. Red, Ubame Mascara in Inked, Natural Dry Shampoo, Gel Brow in Pilsner (medium brown) and Eyelash Curler. This all comes in a smoky gray acrylic slide top box with mirrored bottom. If you know someone who likes makeup and who liked to keep makeup at the office, this would be the perfect gift. It has tall the essentials of a regular makeup kit and more, especially for getting ready for a night out on the town straight away from work. Which is often very hard to do. With this kit though, it can be done quite easily. Just fix yourself up a little bit and voila! Ready for a night on the town. Apply some mascara, eye color, lipstick, dry shampoo and some blotting papers. Easy peasy. This would be a great gift for a co-worker or for a relative. It is available from www.sephora.com. Like SEPHORA on Facebook: https://www.facebook.com/Sephora?ref=br_tf; Follow SEPHORA on Twitter: @Sephora, Follow SEPHORA on Pinterest: http://www.pinterest.com/Sephora/; Follow SEPHORA on Instagram: http://instagram.com/SEPHORA#; Subscribe to SEPHORA on YouTube: http://www.youtube.com/channel/UC9YX5x_VU8gfe0Oui0TaLJg; Follow on Google+: https://plus.google.com/+ Sephora/posts; Follow SEPHORA on Wanelo: http://wanelo.com/sephora and Follow SEPHORA on Tumblr: http://theglossy.sephora.com/.